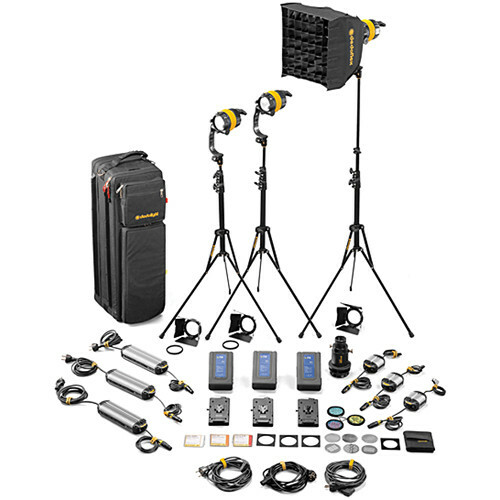 The Dedolight DLED4-D Daylight LED 3-Light Master Kit offers a complete mains and battery-powered, three LED light head setup with a Dedoflex mini softbox, a DP1.1 imager, three mains power supplies, three battery power supplies, three 95Wh Li-ion battery packs with V-lock mount and integrated chargers, three DST stands, and a soft case for carrying. This provides you with a compact, yet powerful light capable of 5600K that is focusable from 60 to 4°. The light is also dimmable and has an excellent CRI of >91 for excellent color rendition. Additionally, the light has tilt with permanent friction and cools passively, meaning no loud fans to interrupt shooting. The DLED4 will output up to 36,000 lux at 3' while in spot mode. Having paved the way with the on-camera Ledzilla LED and the 1 x 1' stand-mounted Felloni Dedolight continues to forge ahead with the introduction of the Mobile DLED4.1-D LED Light Head (Daylight). Again using aspheric lens elements results in an amazing 1:20 flood to spot ratio with a beam angle of 60-4 degrees that delivers 27,000 lux in spot mode at 3.0' with no UV radiation emitted. A wide angle attachment increases coverage 85-54 degrees. The 5600K daylight balance blends in seamlessly in outdoor situations and is ideal for location and ENG work, and as is characteristic of LED sources, generates negligible heat. The DLED4.1-D is powered by the 100 to 260 VAC DT4.0-1 or DT4.0-1-DMX which offers remote control of the light's 100-20% dimmable light intensity. A DC power supply is also available for battery power sources up 18V. A full line of accessories from scrims and filters to Dedolight Imager projection attachments is available. This Dedolight DT4 Power Supply (90-260 VAC) is a small, lightweight power source for the DLED4 tungsten and daylight balanced heads. The self-seeking voltage unit can be used virtually anywhere there's electricity and provides stable power that's dimmable from 100 - 20%. The DT4 comes with an 8.2' mains cable. Box Dimensions (LxWxH) 8.25 x 4.6 x 4.0"
Box Dimensions (LxWxH) 8.0 x 5.3 x 5.0"
Box Dimensions (LxWxH) 13.1 x 6.4 x 2.3"